Image caption "I am proud we stood united today," Mr Priebus said, "not to partner with these biased networks." The US Republican Party has voted to boycott debates on two US broadcasters if they air planned shows about former Secretary of State Hillary Clinton. Mrs Clinton, a Democrat, would be a favourite in the 2016 presidential race should she decide to run. 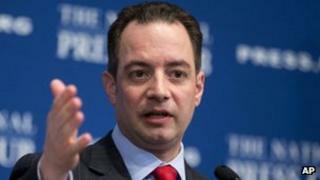 Republican National Committee Chairman Reince Priebus said party candidates would not debate on CNN and NBC. He said the "biased" networks' shows, still in early stages of development, showed their "favouritism". "I am proud we stood united today to pass a resolution not to partner with these biased networks that plan to spend millions spotlighting Hillary Clinton," he said. Mrs Clinton, wife of former President Bill Clinton, has been closely watched as a possible contender for the Democratic Party's 2016 nomination since leaving her position as secretary of state under President Barack Obama in January. Capitalising on her popularity, CNN has announced plans for a feature-length film about her with Academy Award-wining director Charles Ferguson. It is scheduled to air in 2014. Also, broadcaster NBC is in the early stages of producing a miniseries about Mrs Clinton starring actress Diane Lane. The Republican National Committee (RNC) on Friday passed a unanimous resolution preventing it from holding debates among its candidates in the 2016 presidential election on the two networks if they refuse to cancel the Clinton productions. In the resolution, the committee said the productions amounted "to little more than extended commercials promoting former Secretary Clinton" and "political ads masked as unbiased entertainment". Republicans also noted in the resolution that Robert Greenblatt, the chairman of NBC Entertainment, has a history of contributing to Democratic candidates. In 2008 he donated to Mrs Clinton's presidential campaign, and in 2012 he gave to Mr Obama's. "If CNN and NBC continue to move forward with this and other such programming," the committee's resolution reads, "the Republican National Committee will neither partner with these networks in the 2016 presidential primary debates nor sanction any primary debates they sponsor." In a statement, CNN said it had encouraged "all interested parties to wait until the program premieres before judgments are made about it. "Unfortunately, the RNC was not willing to do that." Democratic National Committee spokesman Michael Czin dismissed the vote: "The only thing the [Republican Party] can unite behind is a plan to continue to limit the audiences - and voters - to whom they will communicate." The Republican boycott would also apply to Spanish-language broadcasters CNN en Espanol and Telemundo, which is owned by NBC's parent company, at a time when Hispanic voters are a growing and increasingly key part of the electorate.